Mr Warmbier, 22, was flown back to the US in a coma on Tuesday after 17 months in custody. North Korea said he had fallen ill shortly after beginning a sentence of 15 years hard labour for attempting to steal a propaganda sign from a hotel. He was given a sleeping pill after becoming ill after his trial last year and did not wake up, North Korea said. Joseph Yun, the US state department's special envoy to North Korea, travelled to Pyongyang with a medical team to secure his release. Otto Warmbier's family said they had not heard from him for more than a year and were only told last week that he had slipped into a coma shortly after his trial in March 2016. Fred and Cindy Warmbier have said they were told he fell ill from botulism. They have said they believe he was "brutalised and terrorised by the pariah regime" in North Korea. Mr Warmbier is also believed to have been repeatedly beaten while in captivity, according to The New York Times which quoted a senior US official. Pyongyang confirmed his release in a one-line statement carried by state news agency KCNA on Thursday. It said that Mr Warmbier "had been in hard labour" and was sent home on "humanitarian grounds according to the adjudication made on the same day" by North Korea's central court. An economics student from the University of Virginia, originally from Cincinnati, Ohio. Was in North Korea as a tourist with Young Pioneer Tours when he was arrested on 2 January 2016. In a tearful confession many think was forced, he said his aim "was to harm the motivation and work ethic of the Korean people. 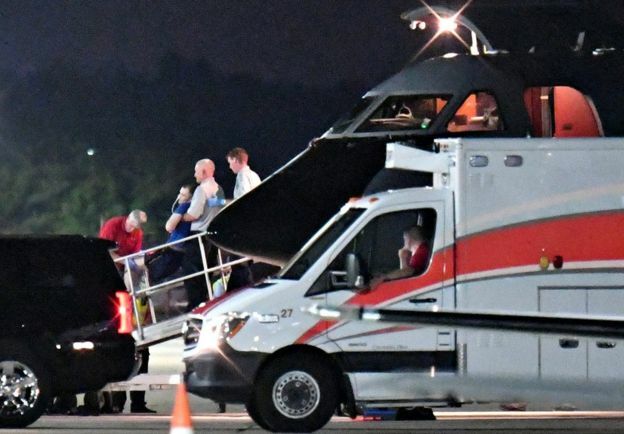 US officials have asked for further information on how Mr Warmbier became so ill.
His release took place soon after the arrival of US basketball star Dennis Rodman in North Korea. But the state department spokesman Heather Nauert said Mr Rodman's visit "had nothing to do with the release". Mr Rodman has told reporters that he was visiting Pyongyang to see if he can "keep bringing sports to North Korea".